New York City's second Homebrew Website Club of April met at The Bean at Cooper Union on April 17th, with me playing host. We didn't really have a "broadcast" portion of the meetup, but we discussed some things and worked on personal projects! mfgriffin.com (new!) — Has been to IndieWeb events in the past, but is looking to get re-started. Went over his past notes about some of his hopes and plans for his site, and how he wants to use it for personal notes, writing, drawing, and blogging projects, and more. Got started on a stripped-down system of using Hugo to track plaintext notes, with tags, so he can worry about how to organize it more later. dmitri.shuralyov.com — Interested in being "done" with his notification system updates. In general, wants to be able to iterate faster on his site updates, and finds that a lot of his time is absorbed in HTML/CSS design processes. Started working on some text-only designs, which get a minimal amount of styling by being converted from Markdown to HTML. By using text and emojis, he was able to prototype a couple of quick things during the meetup. martymcgui.re — Recently decided that he disagrees with how Granary processes his site's feed (which is HTML+Microformats2) into JSON Feed and Atom. The result is that his feeds often have missing info and show up as weirdly empty posts on micro.blog or in Atom feed readers. At the meetup, finished writing and adapter that will take his main feed and spit out a JSON Feed. Managed to break his site's build process trying to integrate it, but will get it working soon enough. The recent release of the original source for Zork and other Infocom games, as they would have been worked on originally, for a compiler that no longer exists. Really neat to see how that info is organized. We want to start later! Folks often need until 6 or 6:30pm to arrive. We're also open to venue options! Thanks to everyone who came out! We look forward to seeing you at our next meetup on Wednesday, May 1st from 6:30pm - 8:30pm! 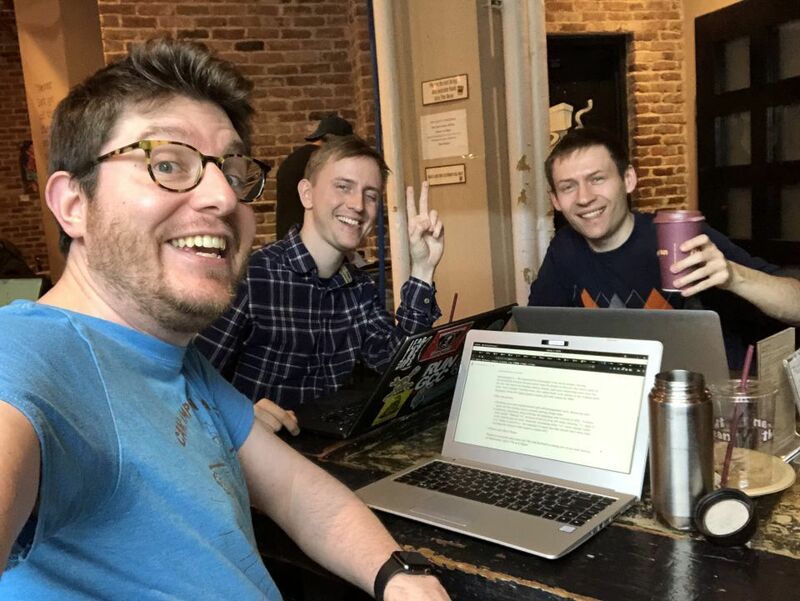 New York City's first Homebrew Website Club of April met at The Bean at Cooper Union on April 3rd, with me playing host. Here are some notes from the "broadcast" portion of the meetup! zazzyzeph.biz (new!) — Learning about Progressive Web Apps and their features, like web app manifests. Started out wanting to learn ES6 and decided to roll back to some basics. Doesn't have a specific project in mind, yet, so doing lots of reading. martymcgui.re — Re-organized his homepage to be much simpler, moving incrementally towards having easier ways for people to discover the newer parts of his site, like where he displays photos, listens, and more interesting ways than his main "river of posts" timeline view. Also added book cover photos to his reading posts (example) using the Open Library Covers API with lookup by ISBN. Building your own organizational and self-management tools. Balancing time spent on that tooling versus actually getting things done. Updating, migrating, and archiving old behaviors and versions in APIs. "Gradual code repair". Making "v2" versions of pieces of an API while allowing "v1" apps to work, hybrid apps to work. Semantic versioning when "v2" could change wildly - is it "really v2-pre-0.0.1", for example? A name like that should warn away folks starting new projects that expect a stable API. Thanks to everyone who came out! We look forward to seeing you at our next meetup on Wednesday, April 17th at 6:30pm! New York City's second Homebrew Website Club of March met at The Bean at Cooper Union on March 20th, with me playing host. dmitri.shuralyov.com — Working on his notification system, specifically tracking (un)read status of notifications from Gerrit. Today was exploring pieces of the system he'll have to modify to get this to work and now has a list of which pieces need updates. In his previous notification system, any fetch of a notification marked it as read, but that will change because it gives him more control over the system. Also made an update to the Homebrew Website Club main page to make the event description clearer, using text that we include on individual HWC event pages now. martymcgui.re — Did a lot of digging into what's possible with MediaWiki templates, with the goal of simplifying the creation of Homebrew Website Club event pages on the IndieWeb wiki. He was able to get an "hwcdate" template together that outputs the date portion (2019-03-20) of event pages like events/2019-03-20-homebrew-website-club-nyc. Maybe created some tech debt, given how that locks in our URLs, but hopefully it will save some copy-paste-tweak labor. MediaWiki and its relation to Wikipedia and as an open source project. Many mediawiki installs become stale quickly, for some good reasons! Finding documentation on parts of mediawiki can also be confusing, as the common terms may point to similar but unrelated topics, may be outdated, may refer to plugins or extensions you don't have, or may refer to functionality available in newer versions of mediawiki. How we learn and modify the tools we use to write and edit code. The trade-offs between using something we're comfortable with versus trying to pick up and become proficient with new tools. Sublime and vim and emacs and VisualStudio Code and all their plugins and ways of integrating with services and supporting different languages. The Language Server Protocol for standardizing how editors can provide "smart" features like autocomplete for different languages and projects. Synchronizing work-in-progress code. Is Git too much overhead? Maybe! Dmitri likes using Dropbox. Thanks to everyone who came out! We look forward to seeing you at our next meetup on Wednesday, April 4th at 6:30pm! 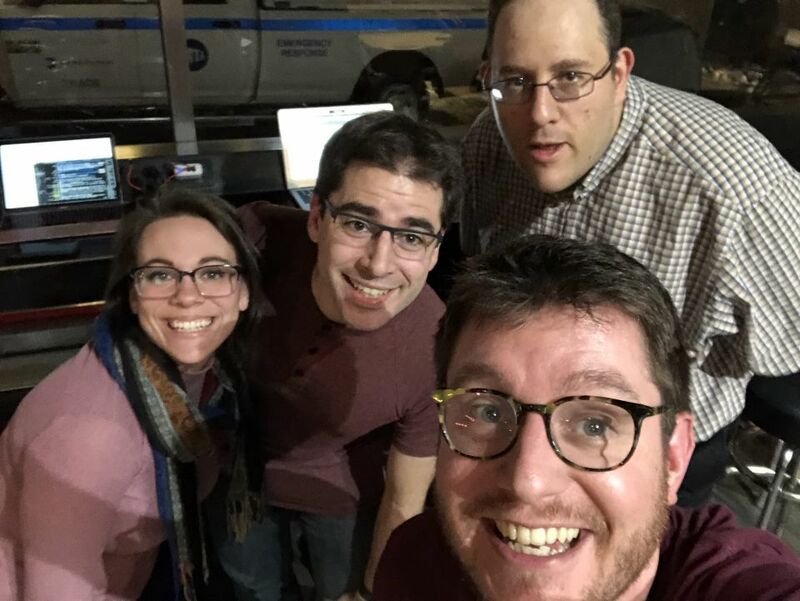 New York City's first Homebrew Website Club of March met at The Bean at Cooper Union on March 6th, with me playing host. dmitri.shuralyov.com — Has many things to demo since last time! Left himself some to keep working on projects tonight. Most of his work is in Gerrit but it's main notification system is sending emails. Last time he was collecting those emails. But in processing the emails he realized they were missing info like user IDs and avatars. Changed to use the email as a notification of a notification - to trigger a fetch via the Gerrit API to grab the information he wants directly, looking for changes between the last time he updated and the time of the email. Been working on notification displays since. Has a reverse-chronological timeline where notifications flow by. Finds it less stressful than GitHub's notification system! martymcgui.re — Completely forgot his work on timelines and re-styled listen posts! 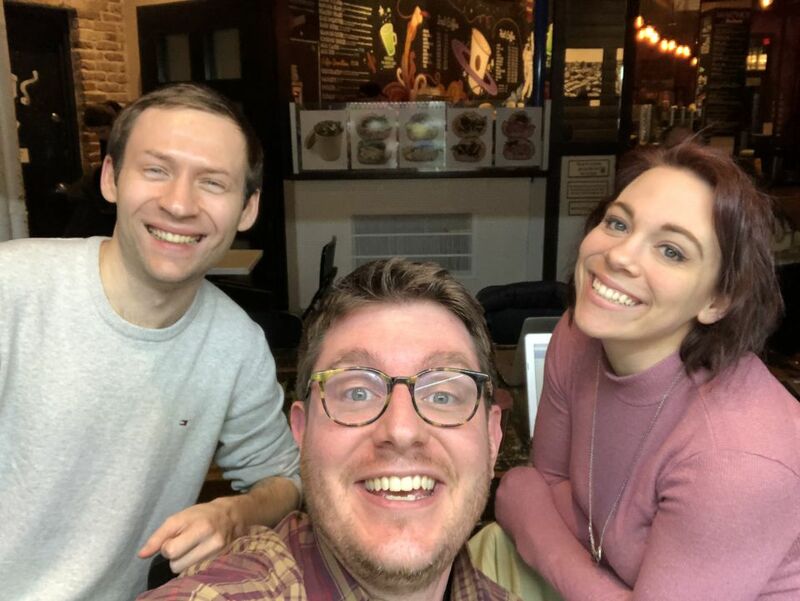 Launched BloodReads.com, a silly promo site for and upcoming Ides of March GHOST PARTY 👻🎉 show themed on BETRAYAL and also MULTI-LEVEL MARKETING. Used a template from HTML5up, which were recently discussed in #indieweb-meta as having a template that might be a good fit for the IndieWeb homepage redesign. Started work on a new section on his site dedicated to improv, so folks can find his upcoming shows, past events, etc. It's cold but not rainy this week! Walk fast to stay warm. Density (and wasted space) in web designs. What goes into a good homepage? Are there parts of your site that exist but you don't necessarily guide people to easily? Rolling up and grouping noisy notifications, and choosing how to order notification details by priority. Thanks to everyone who came out! We look forward to seeing you at our next meetup on Wednesday, March 20th at 6:30pm! New York City's second Homebrew Website Club of February met at The Bean at Cooper Union on February 20th, organized by Tiara Miller and myself. rootedfromnature.com — Finished a Python lab assignment! Felt like she was overthinking it. Also doesn't like that the particular problems are more math problem than coding problem. Plans to sign up for actual coding classes to get more practical coding experience. dmitri.shuralyov.com — Wants to visualize notifications from GitHub and Gerrit. He collects the data (sometimes by processing emails!) on his own site and wants to expose it. Spent some time thinking / brainstorming about how to design those things. Asked some fellow Go programmers about known ways to handle emails w/ Go. Wants it to work "forever" (the next decade) so is being careful about the design. martymcgui.re — Played with layouts for his new /listens page. Looked at Pinterest and Dribbble and other design sites for "timeline" layouts and was pretty unhappy with what he found. Lots of "draw a line with labels and draw lines extending off to things." So, took some time to start extracting "listen" bits like podcast art, episode title, audio links, into simpler blocks to start playing with layouts. Things that Go is really good at. Like being an http2 server! This new location! It... seems fine? It was crowded when we came in but we eventually got a table. No outlets handy as far as we could find. We'll keep looking for new venues! IndieWebCamp Austin is this weekend! IndieWebCamp Online is also only a couple of weekends away! IndieWebCamp New Haven is at the end of March and planning is getting scrambly! There are wiki pages to create but there's a lot of missing information and content yet! Tiara has been co-organizing w/ wiki stuff. Marty volunteered to help, too. Being remote, we need Greg to fill in with his local knowledge about the area and venue though! What about IWC NYC! Yeah we'll do one too. Later in the year, though. Thanks to everyone who came out! We look forward to seeing you at our next meetup on Wednesday, March 6th at 6:30pm! 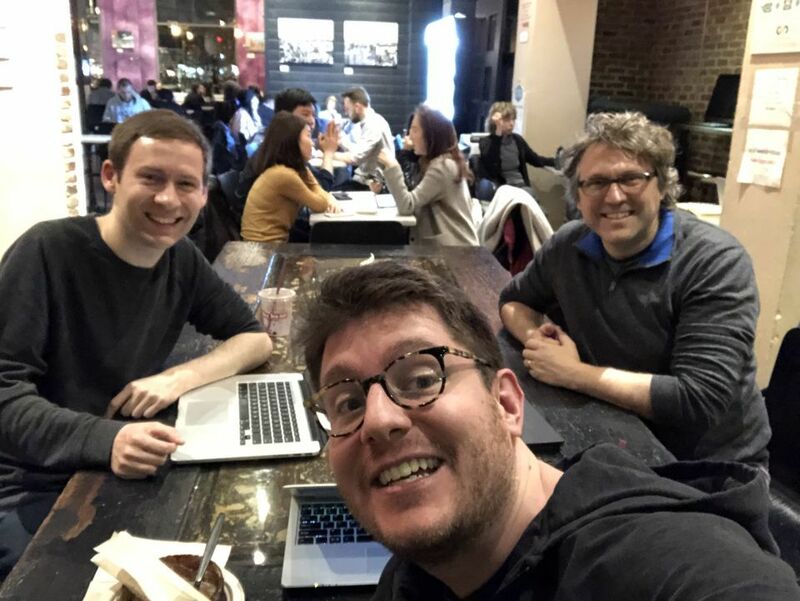 New York City's first Homebrew Website Club of 2019 met at Aroma Espresso Bar on February 6th. Here are some notes from the "broadcast" portion of the meetup. aaronparecki.com — Was working on fixing Quill's URL resolution for IndieAuth login (e.g. so you can login with a shortdomain like aaronpk.com and have it resolve to https://aaronparecki.com/). Got distracted by Marty showing an iOS Shortcut that works like Teacup to post ate/drank posts via Micropub. Made an iOS shortcut to allow him to upload videos to his site. martymcgui.re — Spent quiet hour porting some old notes out of Evernote-like browser-based app Laverna into his personal notes site. Just housekeepin'. Current personal site project is probably getting event hosting up for his upcoming improv and livestreaming shows. david.shanske.com — Wrote a post saying something is ready to test. Current project for his site: everything. Took a break for a few days and doesn't know what is next. What do you mean this coffee shop's hours have changed to close at 7pm? There's a Starbucks like two blocks away, I guess. Thanks to everyone who came out! We look forward to seeing you at our next meetup on Wednesday, February 20th at 6:30pm! Baltimore's second Homebrew Website Club of November met at the Digital Harbor Foundation Tech Center on November 27th. 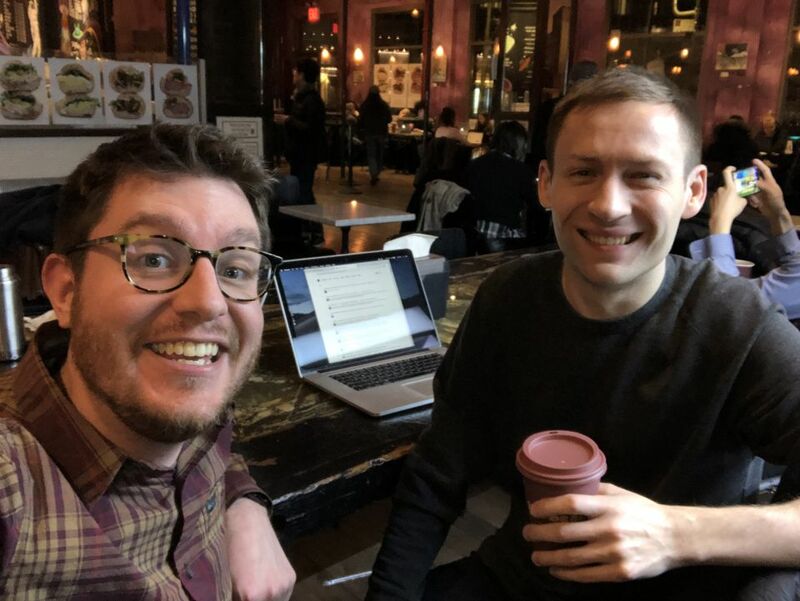 jonathanprozzi.net — Spent quiet writing hour writing a post about his 2018 and 2019 commitments! He wants to finish some personal writing tasks, capture some of the things he's been working on recently, and do some development. rhearamakrishnan.com — Edited a poem during our writing time. Nice! Been reflecting on HWC and how it allowed her to use the web and her website to focus and promote her work and writing. Has a lot of new material to edit together before publishing. Just went to an intensive writing workshop in New York and generated a lot of new writing to work through. Rosco — Working on a browser-based game for students at DHF to learn programming concepts. Thinking about starting with physical versions of the game first, maybe translating to the web later. 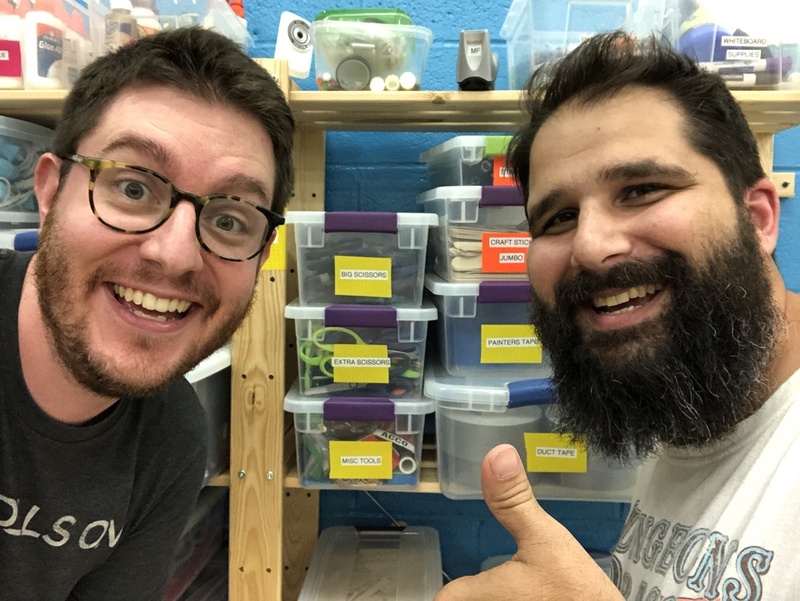 ashturner.net — Also working the programming tutorials and experiences for teaching computing concepts. Arrays and for-loops are particularly tricky for beginners. Ash discussed some inspirational single-purpose websites for teaching concepts, like The Bézier Game, and KERNTYPE. Has a personal website built on Adobe Portfolio, but interested in moving off of that because she doesn't want to pay for Creative Cloud anymore. martymcgui.re — Doing lots of unseen plumbing work on his site, nearly read to flip over from a Jekyll-powered site to a Hugo-powered site. It's likely that no one will notice the difference! Also been playing a lot with iOS Shortcuts (formerly Workflow) and built a Workflow to take an iOS Live Photo, turn it into an animated GIF, turn that into a looping video, and post the video to his site. Here's an example post. Being able to do this helps him feel less anxious about having Live Photos on his phone and feeling like they're inaccessible. derekfields.is — Been going to conferences and talking to companies about jobs. Also working on his LED backpack for cyclists startup. Accelerometer detects braking, turning. Been playing with WebUSB a bit, like with gamepad controllers. GitHub Pages for hosting. Rhea built her site there, using some tutorials from Codecademy. Likes the simplicity of HTML and CSS, loads fast. GitHub credentials, SSH keys as "a password that gives your laptop the power to act as you". How to advertise HWCs better (we missed posting it on FB etc last time). Particularly since we have a "weird" schedule, sometimes on Tuesdays, sometimes on Wednesdays, we should be consistent about advertising them. We should probably document our processes on the wiki. Thanks to everyone who came out! We look forward to seeing you at our next meetup on Tuesday, December 11th at 7:30pm! 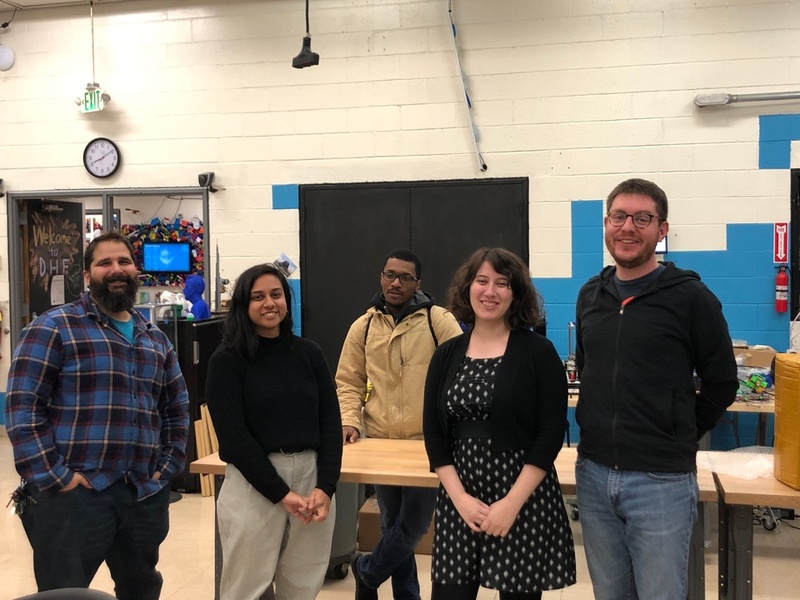 Baltimore's first Homebrew Website Club of November met at the Digital Harbor Foundation Tech Center on November 13th. jonathanprozzi.net — Ran into an issue with his homepage. Some nginx rule was falling back to a default site. Got it fixed, though. Been doing lots of web dev for work, but none for his personal site. martymcgui.re — Been traveling a lot! Went to IWC Berlin and Accessibility Club and had a great time! Grateful to catch up with and meet new people in the IndieWeb community. Worked on month/year archive navigation for the new Hugo version of his site, which is very close to being feature-complete compared to his Jekyll site. IWC Berlin! Marty went and there were many good sessions. Changes in organizing HWCs (wiki stuff) and related events (travel sponsorships for IWCs, peripheral events that could bring people into the IndieWeb community). Replacing Flickr. Flickr dumping free content beyond the latest 1000 images. DHF relies heavily on Flickr albums, including using them for the homepage of their site. Will probably get a Flickr Pro account now, request an export to make sure their photos are safe. WordPress accessibility issues around the new Gutenberg editor, the problems with Automattic pushing it through without listening to community. Yikes. Thanks to everyone who came out! We look forward to seeing you at our next meetup on Tuesday, November 27th at 7:30pm! Baltimore's second Homebrew Website Club of October met at the Digital Harbor Foundation Tech Center on October 16th. 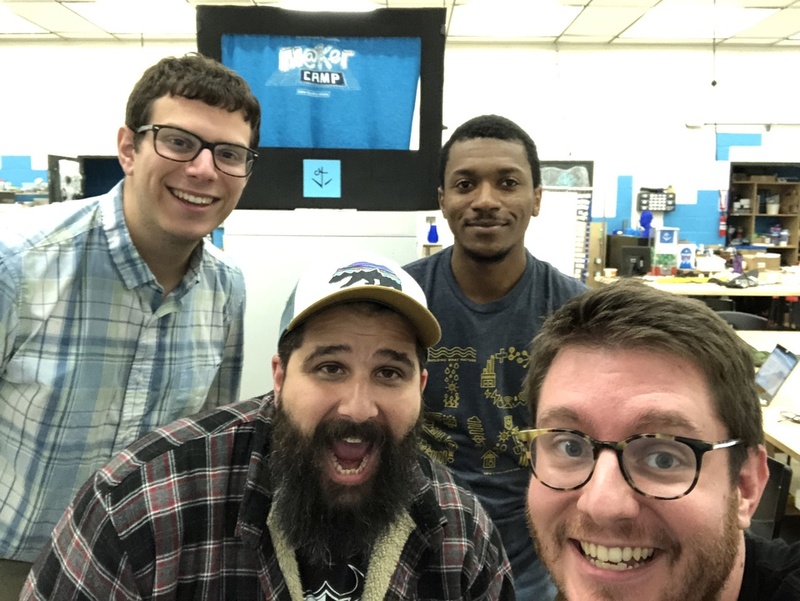 jonathanprozzi.net — Worked today on a post recapping our last HWC meeting, focusing on ideas to get more people involved. For work at DHF, still learning lots of NextJS and ExpressJS. Getting back into writing content! derekfields.is — Been a while! Last week in Minnesota for some networking. Met some cool people and talked to some companies, including Socrata, which was part of Open Baltimore. Also got back into bullet journaling after being away for a while. Working on legal and client-finding stuff for his freelance work. pulianas.com — Also been awhile since he's been to an HWC! Moved all his sites to HTTPS. 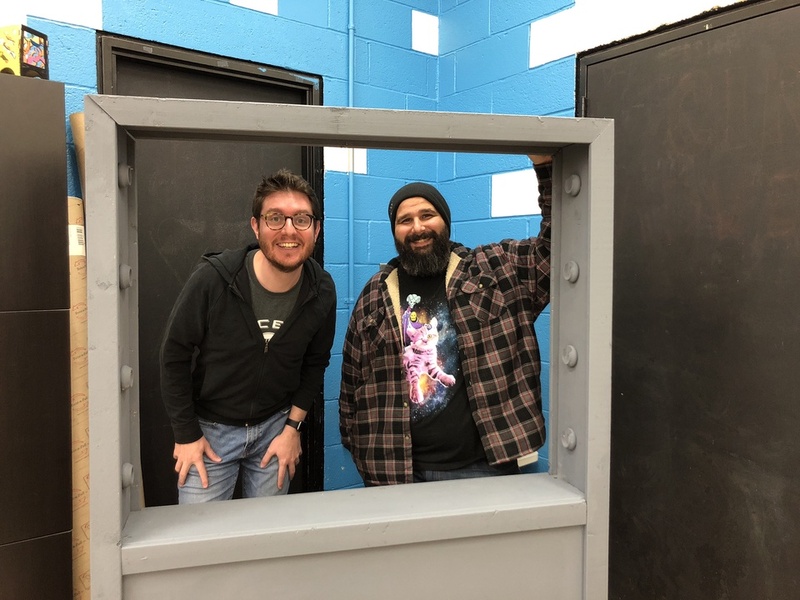 His podcast (overanalyzed.fm) is now on iTunes, so he added that link to the site. Also tried to track down an official Overcast button but hasn't found it yet. Recently in San Jose for API World. Very little talk about building APIs and more about pitching specific products/services. Did learn a bit about microservices and case-studies of moving to them. Did some general maintenance on his WP site, and has been working on his own plugin for podcasting on WP. martymcgui.re — Been heavily porting his site from Jekyll to Hugo. Has had some fun porting things that he did as Ruby plugins for Jekyll into crazy Go template logic, like generating permashortlinks in NewBase60. Also had some fun setting up a new CSS Grid display for photos in posts with lots of them (example which apparently only works in Firefox). Also, after some struggling with his image proxy setup (because Hugo templating doesn't support HMAC signatures) is trying out Cloudinary's free tier for his image-resizing needs. Podcasting on WordPress is... a pain. Apple Podcasts refused to accept their feed due to http vs https issues and that was hard to track down. Ferrite for audio editing on the iPad. Alec edits his podcasts there now. Some hiccups with the noise-cancelling and auto-levelling features being too-aggressive. Recording setups. Blue's new Yeti Nano looks cool. FF and Chrome starting to support the new dialog element. Maybe cool, maybe terrible? Thanks to everyone who came out! We look forward to seeing you at our next meetup on Tuesday, November 13th at 7:30pm! Baltimore's first Homebrew Website Club of October met at the Digital Harbor Foundation Tech Center on October 3rd. jonathanprozzi.net — No updates since last time for his personal site. Was burned out after a lot of frustration with Gatsby + WordPress headless. Got to the point of feeling helpless and like he couldn't figure out how to progress. Started porting to Next.js and has some renewed energy because he is making progress and enjoying it. martymcgui.re — Went to IndieWebCamp NYC! Didn't do anything new for his site, but did manage to write a post full of project ideas that he came away with. Really interested in using free services like Glitch (for server-side processing), Neocities (static file hosting), and Cloudinary (make thumbnail images from those giant originals) to make IndieWeb building blocks that people without coding experience could combine to make their own sites. Currently thinking of building a Micropub Media Endpoint that handles dynamic image resizing to see how this approach works. Ideas from the IndieWebCamp NYC Organizer's meeting about "messaging" for Homebrew Website Clubs. The name is often confusing or off-putting for newcomers, and oddly self-selecting for those that "get it". Thinking about rebranding to "Indie Web Meetup" – evokes "independent web" and a meetup is more inviting than a "club" which might have membership requirements. Talked a lot about how many folks who come to HWC are WordPress users and how we might do better by them if we made it more clear that we are here to help them power up their WordPress sites. Or even go a step further and simply offer to get people started with or improve their existing personal site. If we can get people to the meetups, no matter the skill level, we can get them started: sign-up for micro.blog to get going right away, put a simple static HTML page up on glitch or GitHub, dive into WordPress, etc. First steps may be to think of it more like an open hours help desk. The "price" of getting help can be to write up all the steps followed, as a way of documenting steps for future folks who might need it. The goal would be to have folks come and actually leave with something accomplished. Also talked about difficulties with estimating the limitations of tools before you invest a bunch of time in learning to use it and understand it deeply. 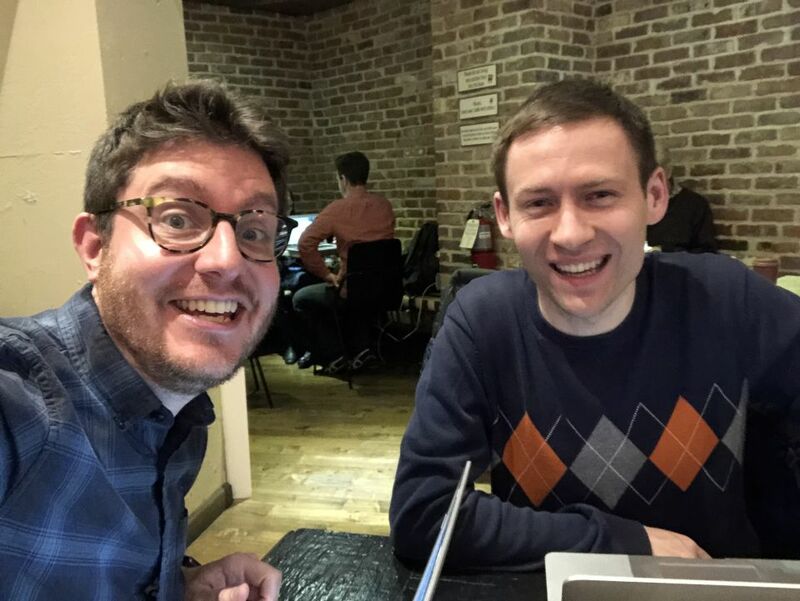 Jonathan's experience with Gatsby was a prime example – ultimately he needed it to do something it didn't support well, but it took a lot of frustration to find out that the issue was with the tool being a bad fit for the problem. This ended up being a very organizer-y meta meeting. It was nice to be able to check in with ourselves about this meetup and its future. We are excited to continue to evolve! We look forward to seeing you at our next meetup on Tuesday, October 16th at 7:30pm!